Background and aims Rapid viral response (RVR) during antiviral treatment for hepatitis C virus (HCV) predicts sustained viral response (SVR). Recently, vitamin D levels have been associated with SVR. As sunlight is the most important source of vitamin D and shows seasonal variation, we evaluated the effect of season on viral kinetics during peginterferon/ribavirin-based therapy for HCV. Methods Consecutive HCV patients treated with peginterferon/ribavirin and boceprevir/ telaprevir (June 2011–July 2014) were included. Patients were grouped according to season when therapy was initiated (Season A: May–October and Season B: November–April) depending on hours of daily sunlight. Multiple logistic regression analysis included factors known to influence SVR to treatment. The dependent variables were undetectable viral load (VL) or VL ≤15 UI/mL (VL ≤15) at weeks 4, 8 and 12, end of treatment and SVR. Results The study included 930 patients (66.8% men; median 54 years) treated with telaprevir (n=537) or boceprevir, without (n=481) or with lead-in therapy of peginterferon/ribavirin. Baseline characteristics of patients in Season A (45.3%, n=421) and Season B groups were similar. Overall, a higher rate of RVR (23.5% vs 16.1%, p=0.005) and VL ≤15 (51.0% vs 38.6%, p≤0.001) was observed in patients starting treatment during Season A versus Season B. By logistic regression analysis, initiating treatment in Season A proved to be an independent predictor of RVR and VL ≤15. Conclusions In our setting, seasonality affects viral kinetics in HCV genotype 1 patients treated with peginterferon/ribavirin-based therapy. Our findings support the hypothesis that vitamin D influences viral response to peginterferon/ribavirin-based therapy. ▸ This is the first study to establish a link between the season of initiating interferon/ribavirin-based therapy for chronic hepatitis C and viral response to treatment. ▸ Patients starting treatment during the season with the highest daily hours of sunlight showed the highest rate of rapid viral response. ▸ Our results suggest that viral response to treatment is influenced by the hours of sunlight, and by inference, sunlight exposure, a surrogate marker of vitamin D levels. ▸ Our findings support the hypothesis that vitamin D influences the viral response to peginterferon/ribavirin-based therapy. Vitamin D is known to play a key role in calcium and bone homeostasis, but there is emerging evidence that it also has antifibrotic and anti-inflammatory properties.1 ,2 In fact, latest studies have found an association between low vitamin D levels and risk of severe chronic hepatitis C (CHC) and cirrhosis,3–5 suggesting that vitamin D deficiency may be involved in the progression of chronic liver disease.6 ,7 In addition, vitamin D has immunomodulatory properties and in vitro experiments have shown that cholecalciferol has antihepatitis C virus (HCV) effects, which may theoretically improve response to antiviral therapy in patients with CHC.8 More recently, vitamin D has been shown to reduce anaemia induced by ribavirin avoiding dose reduction.9 Finally, recent studies have shown that vitamin D levels correlate with viral response to treatment.3 ,10–12 However, some investigators have not corroborated these findings;7 the discrepancy of results has been mainly attributed to methodological limitations and bias, and thus more evidence is needed on this issue. Given that the major source of vitamin D is exposure to natural sunlight, and that sun-induced vitamin D synthesis is greatly influenced by season,1 ,16 our aim was to evaluate the effect of season on viral kinetics with peginterferon/ribavirin-based therapy for CHC. Patient data were obtained from a prospective multicentre registry promoted by the Spanish Association for the Study of the Liver (HepatiC Registry database). The present study included consecutive HCV genotype 1 patients attending the participating centres and treated between June 2011 and July 2014 with peginterferon/ribavirin and telaprevir or boceprevir. Patients were recruited from different geographical areas and classified accordingly: Northern, Central and Southern Spain. 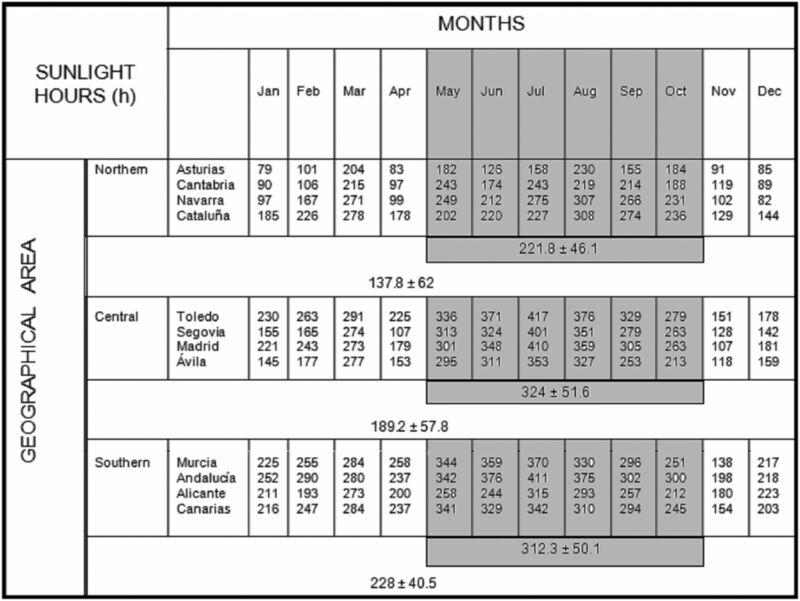 The month of initiating therapy was obtained from the database and patients were grouped into Season A (from May to October) and Season B (from November to April), that is, the months with higher and lower hours of sunlight during 2012 according to the Spanish Meteorological Agency records17 (figure 1). In addition, to evaluate the effect of initiating treatment during the months with the highest versus the lowest daily hours of sunlight, intermediate months were excluded and patients were grouped into Season A′ (from July to September) and Season B′ (from January to March). Number of hours of sunlight per month in 2012 according to geographical area (Northern, Central and Southern Spain). Data modified from original source available at: http://www.aemet.es/documentos_d/conocermas/biblioteca/calendarios/cm-2013.pdf. Patients were also grouped according to the type of treatment, that is, with or without peginterferon/ribavirin lead-in therapy. HCV viraemia (quantitative, qualitative and log RNA) was recorded at baseline and during treatment at weeks 4, 8, 12; at the end of treatment and 24 weeks after treatment completion. Viral responses were evaluated at different time points, and RVR defined as undetectable HCV RNA at 4 weeks and SVR defined as HCV RNA indetectability more than 24 weeks after treatment completion. We also recorded cases with VL ≤15 UI/mL (VL ≤15) measured at week 4. Blood samples drawn at the start of treatment were only available from a single centre in the Northern area and were used to evaluate vitamin D levels, determined by electrochemiluminescence. Values are expressed in nmol/L. Approval for the study protocol was obtained from the promoter’s research ethics committee and written informed consent was obtained from all participants. The study was conducted in accordance with the principles of the 1975 Declaration of Helsinki. Categorical variables are expressed as frequencies and percentages. Continuous variables are expressed as means and SDs. The assumption of normality was tested with the Kolgomorov-Smirnov test. Comparisons of continuous variables between groups were carried out with Wilcoxon-Mann-Whitney test. We used χ2 or Fisher exact tests to compare proportions, as appropriate. Two multiple logistic regression models were constructed. The dependent variable was RVR in the first model and VL ≤15 in the second. In both models, season of treatment initiation was the main independent variable, controlling for VL, genotype 1 subtype, IL-28B status, degree of fibrosis, age, type of treatment, presence of diabetes and previous treatment response. The logistic regression results are expressed as ORs and 95% CIs. Statistical analysis was performed using SPSS program V.15.0 for Windows (SPSS, Chicago, Illinois, USA). All p values lower than 0.05 were considered statistically significant. The study included 930 consecutive patients (66.8% men; median age 54 years, range 15–81 years) treated for HCV with at least 4 weeks of follow-up. Regarding treatment initiation, 45.3% of patients (n=421) started peginterferon/ribavirin-based therapeutic regimen during Season A and 54.7% (n=509) during Season B. Table 1 shows their baseline demographic, clinical and analytical characteristics. Regarding the main variables previously described as influencing viral response to treatment, there were no significant differences between the two groups. In our cohort, 51.7% of patients were treated without lead-in therapy (n=8, boceprevir; n=473, telaprevir) and 48.3% of patients with lead-in therapy (n=310, boceprevir; n=64, telaprevir; n=75, discontinued treatment after not achieving a decrease 1 log RNA of baseline VL after 4 weeks of lead-in phase). Among the patients that discontinued treatment after 4 weeks, 26 of 157 patients (14.2%) initiated treatment during Season A and 49 of 217 (18.4%) during Season B (p=0.240). Patients were recruited from different geographical areas of Spain (figure 2), and the season of treatment initiation was equally distributed within regions, except for the Southern area (Northern area, 48.9% vs 51.1%; Central area, 50.2% vs 49.8%; Southern area, 61.8% vs 38.2%, during Season A and Season B, respectively; p=0.003). Schematic representation of patients included in the study according to geographical area. Grey crosses represent patients starting treatment during Season A (May–October) and red circles represent patients starting treatment during Season B (November–April). As expected, patients without lead-in therapy (98% received peginterferon/ribavirin and telaprevir) achieved higher rates of RVR (35.1% vs 2.7%, p≤0.001) and VL ≤15 (79.2% vs 6.8%, p≤0.001) compared with patients with lead-in therapy (69% received peginterferon/ribavirin and boceprevir). Patients with RVR achieved a higher rate of SVR (131 of 155, 84.5% vs 337 of 545, 61.8%; p≤0.001). Similarly, patients with VL ≤15 also achieved a higher rate of SVR (280 of 338, 82.8% vs 185 of 355, 52.1%; p≤0.001). Overall, patients initiating treatment during Season A showed higher rates of RVR (23.5% vs 16.1%, p=0.005) and VL ≤15 (51.0% vs 38.6%, p≤0.001) than those initiating treatment during Season B. There were also differences between patients initiating treatment during Season A′ (n=147) and patients treated during Season B′ (n=290) (RVR, 25.2% vs 18.3%, p=0.104; VL ≤15, 53.3% vs 38.2%, p=0.004). Analysis of viral response according to seasonality and type of treatment showed that patients treated during Season A with lead-in therapy exhibited a higher rate of viral response (RVR, 4.3 vs 1.5 in Season B, p=0.07; VL ≤15,10.4 vs 4.2 in Season B, p=0.013; table 2). Seasonality in patients without lead-in therapy had less impact in viral response, although a trend was observed. Table 3 shows the results of logistic regression analysis. Season of initiating treatment (Season A vs Season B) together with type of therapy (lead-in therapy, no vs yes), HCV RNA (low vs high VL) and IL-28 polymorphism (CC vs no CC) proved to be independent predictors of RVR and VL ≤15. No interaction between seasonality and INF lead-in therapy was found regarding RVR (p=0.145) and VL ≤15 (p=0.300). Furthermore, because the two treatments (lead-in vs no lead-in) differ in terms of efficacy, we performed a multivariate analysis of these groups separately, observing that the season of initiating treatment remained a predictor of RVR (table 4). Viral response was not statistically different between patients initiating treatment in Season A compared with Season B assessed when VL was available at week 8 (n=262 in Season A, n=341 in Season B; VL ≤15, 43.8% vs 56.2%, p=0.703), week 12 (n=395 in Season A, n=465 in Season B; VL ≤15, 45.9% vs 54.1%, p=0.923), end of treatment (n=163 in Season A, n=200 in Season B; HCV RNA undetectable, 46% vs 54%, p=0.437) and SVR (n=328 in Season A, n=372 in Season B; HCV RNA undetectable, 48.1% vs 51.9%, p=0.358). Baseline VL was significantly different between the two periods considered. Nonetheless, this difference was clinically irrelevant and was adjusted for in the multivariate analysis. Analysis was performed considering baseline VL as categorical and continuous variable (quantitative RNA, online supplementary table S1), finding that seasonality remained as an independent predictor variable. Since relapsers do have a different response to retreatment more like naive patients, a subanalysis was performed considering both group of patients together compared with the others. Seasonality remained an independent predictor (see online supplementary table S2). 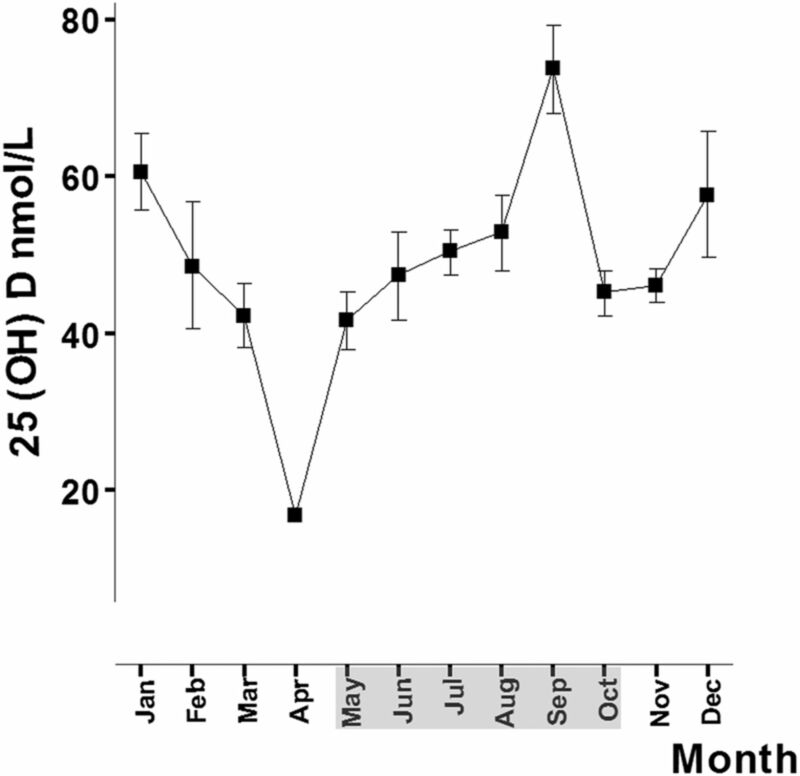 As shown in figure 3, vitamin D levels in our small sample oscillated according to season, but were not significantly different between patients initiating treatment in Season A compared with Season B (49.2±23.4 vs 47.8±20.7 nmol/L, p=828, n=115). Seasonal variation of vitamin D. Vitamin D levels oscillated during the year depending on the season. The months of Season A (May–October) are shaded in grey. This is the first study to establish a link between the season of initiating interferon/ribavirin-based therapy for CHC and viral response to treatment. Our results suggest that viral response to treatment was influenced by the hours of sunlight, and by inference, sunlight exposure, a surrogate marker of vitamin D levels. The most striking finding in our cohort of patients from different latitudes was that a different viral response was observed according to the season of initiating peginterferon/ribavirin-based treatment. In fact, patients starting treatment during the season with the highest daily hours of sunlight, according to the State Meterological Agency,17 showed the highest rate of RVR. We believe our findings are coherent for different reasons. First, the rate of viral response correlated well with the effectiveness of treatment since the largest difference in the response pattern was observed in patients receiving lead-in therapy instead of direct-acting antiviral agents from the outset. Second, multivariate analysis adjusted for variables influencing viral response clearly revealed that seasonality was an independent predictor for viral response. This was observed no matter what VL cut-off value was considered, either undetectable, ≤15 UI or both. In addition, other variables previously shown to influence RVR such as baseline VL >600 000 IU/mL and IL-28B gene polymorphism,11 ,18 ,19 also appeared to be independent factors in our cohort of patients. Finally, our subanalysis of peak months regarding sunlight exposure confirmed the results, albeit with a smaller sample size, and reinforces the overall results. Our data are of considerable importance as RVR is highly correlated with SVR in peginterferon/ribavirin-based regimens.15 ,20 ,21 In fact, in our cohort of patients, RVR was associated with SVR. In addition, our results can be considered as proof of concept that vitamin D levels may influence response to treatment for HCV. Several studies have shown that vitamin D supplementation significantly improves the rate of RVR, early viral response and SVR.29–33 In contrast, other studies have not confirmed better outcomes of antiviral therapy after vitamin D supplementation33 ,34 or any correlation between vitamin D levels and viral response.35 However, methodological bias regarding serum vitamin D measurement has been noted, such as differences in circulating vitamin D binding protein,36 the absence of an optimal and clinically relevant vitamin D level cut-off value37 or the accuracy of vitamin D assays.38 These and other difficulties may theoretically preclude the possibility of finding any correlation trend even if it were present. Our study has certain limitations. First, there is a lack of data on drugs that interfere with vitamin D levels, supplements or dietary intake. Also, data about mutation CYP27B1,29 which has been found to affect vitamin D levels, were not available. Finally, individual sunlight exposure was not available and patients were therefore grouped according to seasons established according to ultraviolet meteo-geographic statistics. In conclusion, seasonality in our setting had an impact on viral kinetics in HCV genotype 1 patients treated with peginterferon/ribavirin-based therapy. Our findings provide further support for the hypothesis that vitamin D influences viral response to treatment. The authors thank Cristina Fuentes and Angel Estébanez for technical assistance, Alejandro Jimenez for statistical support and CIBICAN for editorial support.
. Ribavirin induced anaemia: the effect of vitamin D supplementation on erythropoietin and erythrocyte indices in normal Wistar rat. Int J Clin Exp Med 2014;15:2667–76.
. Sustained virological response according to the type of early virological response in HCV and HCV/HIV. Ann Hepatol 2010;9:150–5.
. Vitamin D deficiency and vitamin D therapy in chronic hepatitis C. Ann Hepatol 2013;12:199–204.
. Optimal serum 25-hydroxyvitamin D levels for multiple health outcomes. Adv Exp Med Biol 2014;810:500–25.
. Vitamin D and HIV: letting the Sun shine in. Top Antivir Med 2011;19:6–10. Collaborators Sabela Lens García; Jose Luis Montero Álvarez; Ángela Rojas Álvarez-Ossorio; Javier García-Samaniego; María Buti; Juan Turnes; J Javier Moreno Palomares; Mónica González García; Beatriz Álvarez Suárez; Carlos Fernández-Carrillo. Ethics approval Approval for the study protocol was obtained from the promoter's research ethics committee and written informed consent was obtained from all participants. The study was conducted in accordance with the principles of the 1975 Declaration of Helsinki.